Easy Slow Cooker Dinner recipes help you get a meal on the table with less stress. There is nothing better than tossing a few ingredients into your slow cooker and walking away to do the other million things on your to-do list knowing that dinner will be ready to serve without another thought. Ohh and did I mention Creamy Chicken Chili is a crowd pleaser! Easy slow cooker dinner recipes are little work for you but make the ones you love happy at the dinner table. Slow Cookers don’t heat up the kitchen which is a great advantage year around. Easy crockpot meals are a dump it and forget it dinner time solution. Slow cooker liners are one of the best kitchen inventions since the crockpot. Liners make your time washing dishes super fast. When you cook an easy meal, you should also have an easy cleanup! Creamy Chicken Chili can feed a crowd, be a two-night dinner or leftovers can be frozen for later which is a huge time saver. Easy crock pot recipes require minimal prep which helps you get out of the kitchen faster. Easy crock pot dinners are great recipes to keep in your easy meal plan rotation. Keeping a master list of a few family favorites is a great help when you are making your grocery list. There are so many great slow cooker recipes that do not take 8 hours to cook. Creamy Chicken Chili is ready in 4 hours with little fuss. 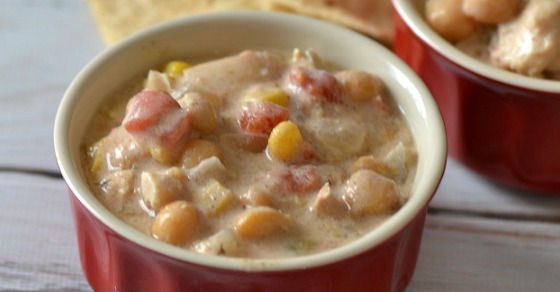 Easy Crockpot Dinner Creamy Chicken Chili is an easy dump it and forget it meal that can feed a crowd. In a 5 qt or larger slow cooker add a slow cooker liner for easy cleanup. Add chicken pieces, green chilis, tomatoes, garbanzo beans, corn, and onion. Add chili powder, cumin, oregano, pepper, garlic powder, and salt. minutes before serving cube cream cheese and stir into chili. Enjoy your Creamy Chicken Chili! A great easy crock pot dinner saves you time and money, so you can enjoy your loved ones. If you are totally in love with great soup recipes make sure to check out this list of yummy Slow Cooker Soup Recipes.